In Upper (Ano) - Elounda, exactly where was filmed the famous TV-Series "The Island" (Spinalonga), based on novel Victoria Hislop, is found the ELOUNDA ART TRADITIONAL VILLAS, little 18th century residential complex, completely restricted, all made from stone and wood, with internal yard, according to a security system typology of the Venetians, when Crete was still a part of the Serenaded Democracy of Venice. 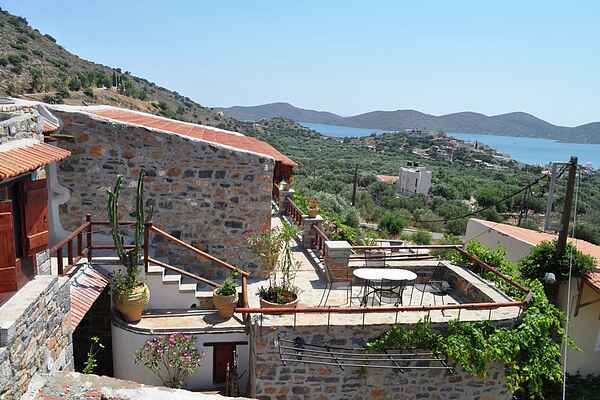 There are 4 residences and 1 studio, completely independent (one from the other), around internal yard, with balconies and terraces, viewing to the magical hills and see of Elounda. The modern commodities are not missing. In our apartments anyone can find modern kitchens, satellite TV, air condition and wireless internet. The complex is constructed in front of an enormous rock named Afendis Christos and is very well visible inside. Indeed, the way that the apartments are structed, offers the possibility to be autonomous or to have company because of the common court. The apartments are one near to the other and so, they are an ideal place for a company of friends or for families that want to have vacations together, near the sea.